Marina Antunes [Celluloid 10.19.18] "drama" "fantasy"
One of the buzzier titles in this year's genre circles is Border, a new drama adapted from John Ajvide Lindqvist's short story "Grans." You may remember Lindqvist as the man behind the much beloved Let the Right One In. The movie premiered at Cannes where our correspondent had a chance to see it and was mostly unimpressed. Border is a modern fairy tale adapted and directed by Ali Abbasi. The movie stars Eva Melander as Tina, a customs officer who can smell fear. When she meets and develops a relationship with a strange traveler named Vore, Eero Milonoff, her life is upturned by revelations that her family has been lying to her about who she is and where she comes from. If you're expecting another horror film, you're likely to be disappointed. 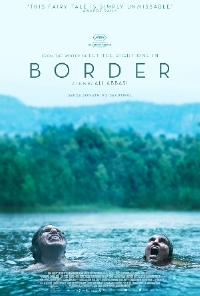 The new trailer for Border suggests this falls squarely in the realm of fantasy and not even dark fantasy though there is definitely a heavy mystery aspect to the story. I must admit that the facial prosthetics are putting me off, it doesn't look like the actors are able to fully emote with all that stuff on their faces. It still looks like it could be a worthwhile watch and I'm curious about Melander's performance which our correspondent was very impressed by.